I was at a friends wedding (Congrats Jenn & Andre) at the Waikiki Aquarium and got to take some photos while the aquarium was a lot less crowded. Also got to play with my friends Nikon DSLR (thanks Will). 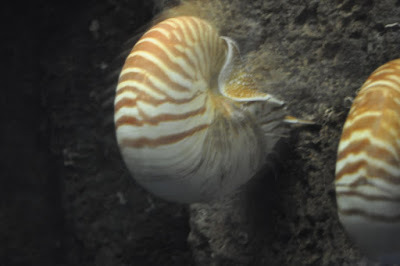 The Nautilus begins this aquarium series. This is a marine mollusc of the cephalopod family. It is only found in the Indo-Pacific and inhabit the deep slopes of coral reefs. We end the week with a Waikiki sunset. This is one of the reasons so many tourists head over to Hawaii. 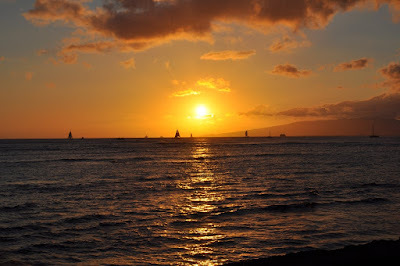 Its always a great sight to watch the sun dip into the ocean among clouds and sailboats. This show was taken nearby the Waikiki Aquarium. Hope everybody has a great weekend. 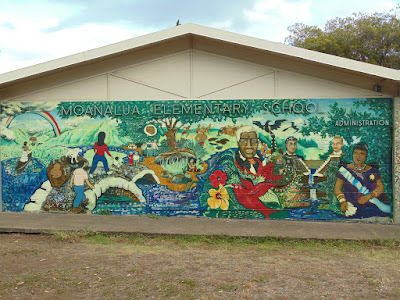 Here is a mural at Moanalua Elementary School. The school was founded in 1884 with 66 students in grades 1 through 4 and a one room schoolhouse near where Moanalua Gardens now stands. In the 2003-2004 year next door school Moanalua Middle School celebrated its 120 anniversary and some sixth graders helped paint the mural. Its is called “Moanalua - Past, Present and Future” and its artist is Jessica Orfe. The mural was done in a partnership with the Honolulu Academy of Arts.